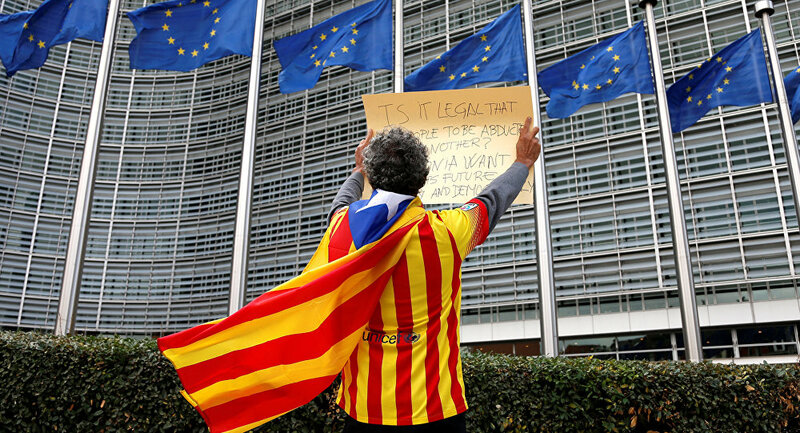 An EU lawmaker told Sputnik on Monday that the European Parliament's leading legislative groups have had refused to discuss the hotly debated referendum on Catalonia's independence from Spain. BRUSSELS Sputnik) — The European Parliament's leading legislative groups, the European People's Party (EPP) and the Progressive Alliance of Socialists and Democrats (S&D Group), which constitute the parliamentary majority, refused to uphold the proposal of the European Free Alliance (EFA) group and bring up for discussion on the issue of the recently held independence referendum in Spain's Catalonia, EFA member Tatjana Zdanoka told Sputnik on Monday. On Sunday, Spain's northwestern autonomous region of Catalonia held an independence referendum despite the fact that the vote had been previously ruled illegal by the Spanish Constitutional Court. Multiple violent clashes between the police and pro-independence activists on the voting day resulted in injuries of at least 33 law enforcers and 844 civilians. "On Thursday, when the session agenda was being adopted, they [EFA] along with 'the left' [European United Left/Nordic Green Left] tried to do it [put Catalonia on the debate list], but it is necessary to have support of the political groups which form the parliamentary majority to add it to the agenda. But since both the European People's Party and the Socialists voted against the debates, we don't have the majority to set them up," Zdanoka said. The European Parliament member added that the initiative was supported by the Alliance of Liberals and Democrats for Europe (ALDE) parliamentary group. In case the Catalonia issue made its way to the parliamentary agenda, European Council President Donald Tusk and President of the European Commission Jean-Claude Juncker would have to present a speech in front of the parliament members. Early on Monday, Catalan Government spokesman Jordi Turull said that 90 percent of Catalonia's population had voted in favor of secession from Spain. Spanish Prime Minister Mariano Rajoy, meanwhile, said that there had been no referendum, whereas international observers at the referendum claimed that the results of the vote should be recognized. Juncker has repeatedly said that the European Commission supports the decision of the Spanish Constitutional Court and urged the parties to act within the rule of law.